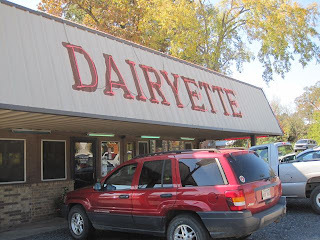 Several years ago I took my parents on a road trip to see our daughters and my brother and his family with a brief stop in the spa to see JC's little brother T.
T suggested we have lunch at a little place that was on our route. I couldn't remember the name of the place so I called Mom and she couldn't remember, but she was sure it was in Mt. Ida because Daddy always like to go through that little town. For once it was a beautiful day in Hot Springs so JC and I hopped in the car and went on a culinary adventure. This was some gooooood eatin' - so hot and crisp that you had to wave it around and blow on it and you still couldn't wait to get that crunchy goodness in your mouth!! 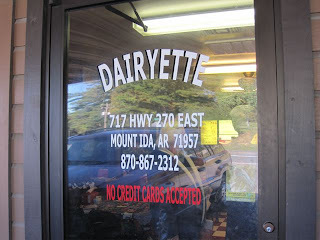 Fried catfish at the Dairyette in Mount Ida, AR. 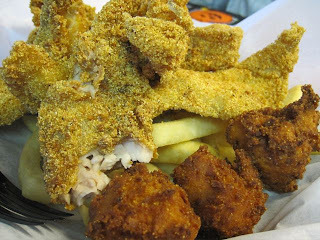 I'm sure the other food is tasty, and they stay busy, but order the catfish - it is sooooo goooood!!!! Corn meal batter? ALMOST makes me reconsider this whole veggie thing. Ha! Glad to see the sun shines in Arkansas!